The majority of the aluminium supplied for architectural products has its natural corrosion resistance further enhanced by additional surface protection. These finishes produce a surface that is both attractive in appearance and low in maintenance. The products made from this material are in a finished condition that requires suitable packing to prevent damage from abrasion during delivery. On site they should be stored in a clean dry area away from cement, lime, paint, acid etc. During installation, they must be protected from building fall‑out such as wet plaster, mortar, paint and welding spatter. Wet plaster and mortar should be removed immediately and the soiled area washed down with clean water. Acid used for cleaning brickwork must be prevented from dripping on to aluminium. Should this occur, the acid must immediately be washed off with clean water. If strippable coatings or pressure sensitive tapes are used to protect exposed surfaces, care must be taken not to damage the finish during their removal. Prolonged exposure to sunlight can make them increasingly difficult to remove. Both painted and anodised finished surfaces should be regularly washed down with water to maintain their attractive appearance. The aluminium-framed balustrading should be washed whenever the glass is cleaned. The frequency of washing is determined by the desired appearance of the structure and by the local environment but should occur at least every six months. Areas close to the sea or subject to industrial fall-out and having limited rainfall require more frequent attention. Wash with warm water and a non‑abrasive kitchen detergent, using a soft cloth or a soft bristle brush. To prevent shiny spots do not press too hard and to minimise streaking wash from the bottom up. Rinse with fresh clean water immediately afterwards to remove all traces of detergent. Washing as recommended for paint finish should first be tried. If this does not remove all dirt build‑up a solvent cleaner such as kerosene, turpentine or white spirit may be used. Failing this, mild oil‑base abrasive car cleaner or mild soap-based abrasive bath cleaner can be used. Thoroughly rinse and dry with a soft cloth after cleaning. A coat of liquid wax may be used to enhance the gloss finish on both finishes. Do not use highly caustic or highly abrasive cleaners on any type of finish. Do not use solvent cleaners on paint finishes. To avoid the possibility of corrosion, only aluminium, stainless steel or galvanised steel fasteners should be used for fixing aluminium. In a marine environment, stainless steel fasteners must only be used. Water running off copper or lead roofing or flashing materials may have a corrosive effect on aluminium. Avoid installing copper or copper alloy products if water may run from them on to aluminium. Insulate and protect aluminium from unseasoned timber as the sap can cause stains that are almost impossible to remove. Liability for all goods supplied passes to the purchaser on acceptance of the installed goods into their care. Operating hardware such as locks and hinges should be checked for tightness of fixing screws and lubricated six monthly with a spray‑on product such as WD40. Installation on or close to the coast should be lubricated more frequently. Attractive, efficient use of glass requires clean glass surface. Unclean glass losses many aesthetics qualities. Dirt on glass is any unwanted substance on its surface. The degree of dirtiness or acceptable cleanliness depends on the end use. There are four general categories of dirt on glass surfaces: Particulates, Surface residues, reaction contaminates, and surface corrosion. Particulates are solid materials loosely deposited on the glass surface. They are best removed with nonabrasive mechanical methods, i.e. high-pressure water spray. Surface residue are contaminates cleaned from glass with detergent washing solutions. Examples include fingerprints, smudges & cutting oils. Reaction Contaminates are those that chemically react to the glass surface, for example alkaline solution leaching from concrete and rust from steel during a building’s life may lead to surface corrosion of Glass. Surface Corrosion technically is not dirt, although a corroded glass surface will appear semi opaque and this can be mistaken for deposited dirt. Surface corrosion is irreparable. In order to maintain a clean glass surface, cleaning must be preformed on a regular basis, the frequency of cleaning the glass is determined by the desired appearance of the structure and by the local environment but should occur at least every six months. Areas close to the sea or subject to industrial fall‑out and having limited rainfall require more frequent attention. Rinse glass to remove loose dirt. Apply mild soap, mild detergent or in extreme cases commercial solvents to glass either by spraying or using clean, grit free cloth or sponge saturated with the cleaning solution. The area of glass being cleaned, normally 1 to 1.5m2, should be completely covered by the cleaning solution. Care should be taken to avoid solvent contact with the glazing sealants, Aluminium framing or other materials that may be affected by solvents. Note: Solvent manufacturers directions and warnings must be followed at all times. The above cleaning solutions should be wiped onto the glass in a circular motion, applying light to moderate pressure. The Glass surface should then be cleaned immediately with generous amounts of clean water, removing the cleaning solution from the glass. In no case should a ‘blade’, ‘scraper’, ‘Steel wool’, or similar tool be applied to the glass surface. Using a squeegee or a clean lint free dry cloth, remove the water from the glass surface. If required, steps 2, 3, 4 and 5 may be repeated. For coated glass surfaces with Low E reflective coating, refer to the manufacturers cleaning recommendation. Glass should not be cleaned in direct sunlight. Care must be taken when cleaning the surface opposite the Austrailain Standards identification mark. This is due to factors inherent in the production process of horizontal tempering. In no case should harsh cleaners or alkaline materials be used on the glass. Stainless steel looks best if it’s cleaned regularly with plenty of water. Drying afterwards makes sure streaky marks aren’t left behind. Remember that simply wiping with a damp cloth is not as effective as it can smear dirt without removing it. Routine cleaning prevents any stubborn stains building up. You don’t need any fancy equipment. For day to day cleaning, plenty of water, some mild detergent and a cloth or soft brush will do the job. You can use a 1% ammonia solution but don’t use bleach – it’s just too easy to make the solution too strong and too hard to rinse it properly afterwards. After washing, rinse in clean water and wipe the surface dry with a soft absorbent cloth. On brushed stainless steel, follow the direction of the polish for best results. An excellent cloth to use is 3M’s Scotch- Brite high performance cleaning cloth. Stainless steel may discolour if left in contact with salts or acids for extended periods. Also avoid leaving carbon steel items in contact with stainless steel, particularly if wet. But if you observe ordinary hygiene measures, like timely cleaning-up in food preparation areas, you won’t have any problems. Sometimes you need a tougher approach. Here’s how to get rid of the most common offenders: Fingerprints, oil & grease marks If a mild detergent or dishwashing detergent doesn’t shift unsightly fingermarks, get rid of them with a bit of glass cleaner on a soft cloth. You can also use a small amount of alcohol, methylated spirits, acetone or mineral turpentine. Then rinse with clean water and dry. You can give longer protection to high traffic areas by lightly rubbing with olive oil or baby oil followed by a polish and shine using a soft cloth. Remove sticky labels as soon as possible. Gentle heat from a hair dryer or a glue gun generally softens the glue for easy removal, or you can warm stainless steel pots and pans in the oven before peeling off the labels. Eucalyptus oil based cleaners (or eucalyptus oil on its own) often work well to remove adhesives. Ensure you don’t leave any glue on the surface – it could trap dirt or break down and cause staining. Apply cream cleanser with a soft damp cloth and rub gently. If the mark still won’t shift, it might be necessary to use a proprietary stainless steel cleaner. These are usually based on dangerous chemicals (such as phosphoric, oxalic or sulphamic acids) and must be handled with care according to the manufacturer’s directions. After cleaning it is important to neutralise the acid with a 1% ammonia or baking powder solution, rinse with clean water and wipe dry. If the rust has worn away the surface, don’t despair! Bad rusting can be repaired with professional polishing but you will need to get expert advice. Apply paint stripper, taking care to follow the safety instructions. You may need to use a nylon brush or scouring pad, but avoid metal scrapers at all costs – they will damage the surface. Hard water scale Heavy lime scale from hard water can be loosened by soaking in a hot water and 25% vinegar solution. Rinse well with a solution of baking powder or 1% ammonia and then with clean water. Always wipe dry. Cement and mortar Cement and mortar splashes should be washed off before they set. Mild acids such as vinegar may be needed but not those using chloride rich chemicals. Never use brick cleaning liquids which contain hydrochloric acid. Be very careful that loosened particles don’t scratch the steel surface. Always rub stainless steel in the same direction as the grain. Rubbing against the grain will spoil the finish and stainless will lose its shine. Worse, rubbing against the grain can damage the surface by creating microscopic crevices where dirt can collect. This can lead to corrosion spots. Fortunately, it’s usually easy to tell which is the right direction. You need to watch out for items like round handrails, which are often polished around their circumference when they’re manufactured, rather than up and down the length of the tube. If you have to scrub a stain to remove it, make sure you use a clean nylon scourer or a cloth with chalk-based cream cleaner. But test an inconspicuous area first as you could end up with a bright polished spot which doesn’t match the rest of the surface. NEVER EVER use steel wool (wire wool) to clean stainless steel. It is usually made of carbon steel and any fragments left behind will rust onto the stainless steel surface. Using any kind of scourer which has previously been used on ordinary (carbon) steel is also a no-no for the same reason. Stainless steel wool scouring pads are available for heavy duty work, like removing burnt food from stainless steel saucepans. These will scratch the stainless steel surface, but won’t leave fragments to go rusty. The technical recommendations contained in this publication are necessarily of a general nature and should not be relied on for specific applications without first securing competent advice. 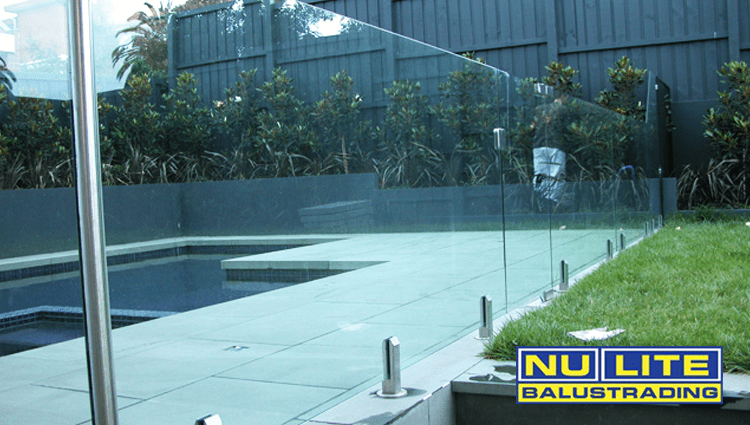 Whilst Nu-Lite Balustrading has taken all reasonable steps to ensure the information contained herein is accurate and current, Nu-Lite Balustrading does not warrant the accuracy or completeness of the information and does not accept liability for errors or omissions.